3. Israel (#7): I was surprised I didn’t get more pushback that Israel should be even higher. I guess no tea-partiers read my site. Oh well. Because if you listened to the GOP debates in the last 6 months, the Israel love-fest was just over-the-top, as if Israel is/should be America’s #1 ally. I support the alliance too, but it seems today in US politics that the central alliance litmus-test is Israel, not Mexico, NATO, SK, Taiwan, or India. This is why I expressed a lot of skepticism over the Asian pivot. I think the US should pay more attention to Asia, but I don’t think the US electorate really cares. 4. Mexico (#2) doesn’t strike me quite as high as Canada, in part because the US got along fine for a long time with hostility from Mexico. Mexico doesn’t have the potential to threaten the US as Canada ever might (the border is smaller; it’s further away from America’s east coast center; its economy has been only semi-functional for almost 2 centuries; it’s culturally more distant so there’s no symbolic quality). Mexican stability and growth are obviously strategically more important than every one else but Canada – way beyond Israel, the EU or the Koreans. And I will concede that Mexico is a greater concern at the moment and in the near future, and will absorb more US effort and money than Canada. This entry was posted in Asia, Foreign Policy, International Relations Theory, Israel, Japan, United States by Robert E Kelly. Bookmark the permalink. To me much of the tempest over Canada perhaps comes from semantics, Robert. When you say Canada is extremely important for US IR policy, you can mean “important” in the sense of 1) We urgently need to get in there and deal with them, or 2) It’s crucial that we maintain and preserve what we have. I think with Canada the meaning is obvious, but with some of these nations I am unsure whether you mean the US needs to confront potential disasters or simply value highly the relationship with them. Two bugs in your ear I would be interested in you addressing. 1) I’m not a Russophile, but do you not see Russia as either a significant ally or problem? 2) In certain circumstances, if the client state provides trade or other economic or political benefits to the empire, couldn’t the US benefit from infantilizing these ‘free riders,’ particularly if it keeps troops employed? This is perhaps one of the dark sides of US militarization– it does tend to create lots of jobs. Wow. Who knew Canada could provoke such interest? I thought it was just a bunch of pot-smoking, grunge music-loving, Vancouver-based hagwon teachers :). (Everything I know about Canada I learned from the Korean media!) It turns out that Canada is the most divisive issue on this blog in months. Russia = bleh. It’s not a problem, definitely not an ally. Just a dysfunctional mess. I wrote about Russia’s Putin-driven decline and got lambasted for it (https://asiansecurityblog.wordpress.com/2012/03/19/its-time-to-de-russianize-the-brics/). But I just don’t see Russia as much of anything for the US – a spoiler maybe. But Romney is just silly and channeling standard GOP throw-away hawkishness about, well, everything when he goes after Russia. In fact, Putin probably secretly likes that sorta talk because it makes Russia sound like it still matters when it really doesn’t: https://asiansecurityblog.wordpress.com/2009/04/01/medvedev-russias-hankering-to-be-a-player/. Interesting thought on US benefits from allies military dependence. I suppose it is a gain, but rather unhealthy one – very similar to ‘military Keynesianism.’ (Chalmers Johnson used to say that a lot.) I suppose, but one reason I like retrenchment is because I think the military plays too large a role in US culture and politics, now after 9/11. (We have talked about this before: https://asiansecurityblog.wordpress.com/2012/05/04/oliver-north-hawks-the-next-modern-warfare-a-new-low-for-the-military-industrial-entertainment-complex/.) 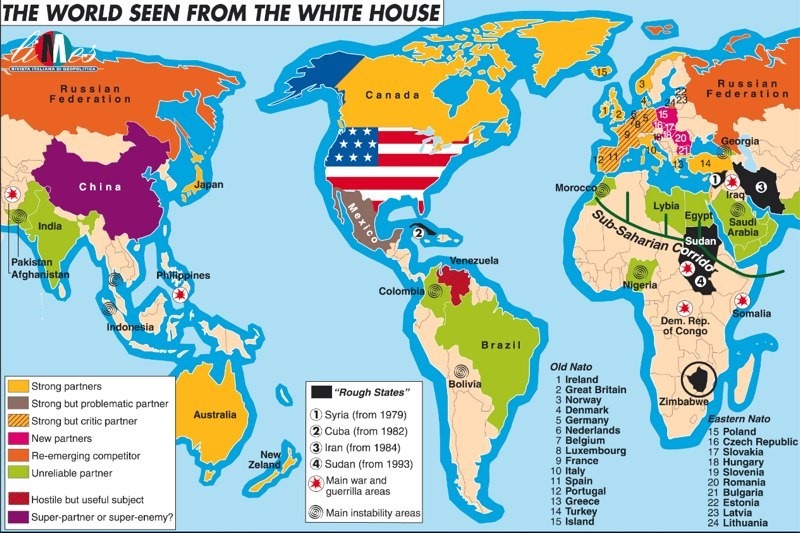 I would like to see America’s allies do more so the US could be less of a war-state which is what we have sorta become since the Cold War, and more obviously since 9/11. What has Canada got that we might want? You mean besides lots and lots of natural resources, and close enough to minimize shipping costs. Not to mention dibs on a huge chunk of the potential resources that become available as the Arctic ice cap melts. And a well educated population, with good infrastructure that already links to ours. And minimal cultural differences (save, perhaps, Quebec — but the Canadians have already worked out how to cope). So if we haven’t taken over Canada (and the Canadians are actually more likely to complain that we ignore them than anything else), why would be be trying to take over anybody else? Yes, there are counter-arguments that could be made. But it definitely disrupts the reflexive “American hegemony” rants. Hear, Hear. My thoughts exactly. Canadians may be unhappy, cold, pot-smoking, hockey-playing American wannabes (joking, joking), but they are a great ally. And they absolutely help tame American excess. Right on. The only reason against putting Canada way up there is that they dont have a lot of alternative options, and that the US can thus afford to be much less accomodating of Canada than of lets say “Rappallo f–k yeah” Germany, or towards nation in East Asia that may be quite tempted to strike a deal with Beijing instead. I think the two largest unknowns within this entire meme are Brazil and Nigeria. Given demographic and economic trends, Brazil will be the 2nd most powerful player in the Western Hemisphere. Furthermore, Brazil possesses the rare capacity to command respect across the ideological spectrum in LA. Nigeria’s future importance stems not from its comparative advantages, but its current deficiencies, which will only be exacerbated by its continuing ethnic-religious violence and demographic explosion. What are your thoughts, Professor? I don’t disagree with these trendlines for either state, but I wonder if they are American allies. That doesn’t mean we should have poor relations with either. But I was trying to use a ‘top 10’ list as a way to cut down America’s spiraling alliance bloat to what is absolutely necessary. And I don’t think the US has major strategic interests in either Latin America (bar Mexico) or Africa. Thanks for reading. As a transplanted Dakotan, I rejoice every day that North Dakota and Canada are producing so much patroleum and natural gas that we’ll never have to deal with Arabs or the Middle East again. And do we need that many allies=-=-it seems that every soldier who perished post V=-J day died in vain. This is why the OP supported the green economy. To break the link with ME oil producers. theres been a few changes. since 2012, sri lanka, myanmar, south sudan, ukraine have jumped on the pro amerikan band wagon. the philipines, and turkey has jumped off. something you got very wrong on this list is that china has ALWAYS been a super enemy ever since 49, the us and its allies have been trying to subvert china. remember all the us bases in south korea, and japan are primarily set there for china.